Key Difference: New York Pizza has a thin crispy hand-tossed crust that allows the person to fold it in half. 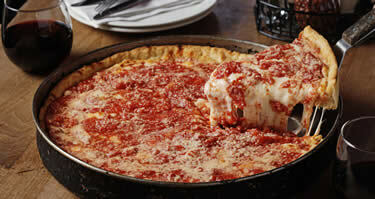 Chicago Pizza has a deep-dish thick crust that is made in a pan similar to a pie pan topped with toppings. Chicago and New York have been constantly at competition, trying to outdo each other in many different categories – from architecture, to the city life and even food. One of the main staples of both cities is pizza. Both the cities tout its pizza making abilities and are often comparing their pizza with the other city. Both cities have a varied taste when it comes to pizza and each on serves up a mean pizza. However, both pizzas differ in almost every aspect – crust, toppings, cheese, etc. The world famous New York pizza is known everywhere. Its characteristics are popular and to this day people still try to recreate a similar taste. The New York Style pizza is a hand-tossed crust that is made from high-gluten bread flour. It is often created in a large size – 18” in diameter and commonly cut into 8 slices. The crust is then topped with a light layer of tomato sauce and a layer of pure mozzarella cheese. 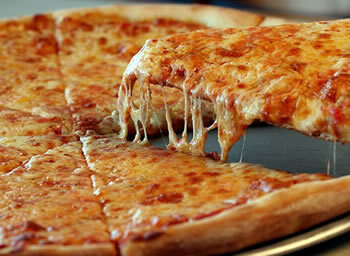 While, the most common is plain cheese, the pizza can also have other toppings. The pizza is meant only for two to three toppings as the dough is too flexible in order to hold more toppings. The pizza is also foldable as it allows mobility, where people can carry the slice on the go. The pizza is served with condiments such as oregano, grated Parmesan cheese, and dried red chili pepper flakes. New York Style Pizza can be dated back to 1905, when the first pizzeria was founded in America in Little Italy, Manhattan. An Italian immigrant, Gennaro Lombardi opened a grocery store in 1987 and was licensed to sell pizza in 1905. This immigrant’s employee – Antonio TotonnoPero – started making pizza pies and selling them at the grocery store. The people could not afford the whole pie and offered to pay by the slice. This started a trend of selling pizzas by the slice. Pero quit Lombardi’s store and opened his own pizzeria on Coney Island. Chicago pizzas also have a popular fan following. Chicagoans have a huge benefit over the New York pizza, as they have the best of both worlds. In addition to deep-dish, they also have the thin crust to offer. The popular deep-dish is a thick crust pizza that is made in a pan, compared to being placed directly on the rack. Approximately 8-10” in size, the pan is layered with sauce, toppings and cheese. The pizza is cut in to 6 slices. The pizza is super heavy and is often consumed with a knife and fork. When served, it resembles something similar to lasagna. The pizza is considered as a proper meal and is expected to eaten when sitting at a table, not while travelling. The pizza can have multiple layers of toppings, anywhere from 3-6, maybe more. It is also not limited to one layer of cheese; it has different types of cheeses. The pizza is served with oregano and chili flakes. There is not enough documentation to determine who invented deep-dish pizzas. However, according to Tim Samuelson, Chicago's official cultural historian, the earliest known deep-dish Chicago style pizza can be credited to Pizzeria Uno’s founder Ike Sewell. Another 1956 articlefrom the Chicago Daily News claims that Uno's original pizza chef Rudy Malnati developed the recipe. A thin crispy hand-tossed crust that allows the person to fold it in half. Deep-dish – a Thick crust that is made in a pan similar to a pie pan topped with toppings. A small layer of toppings that cling to the cheese. Most common toppings include tomato and cheese, cheese and pepperoni, etc. New York pizzas usually have 2 to 3 toppings max. Chicago pizzas are several inches in depth which allows several toppings layered on top of each other. Chicago pizzas have several layers of cheese and multiple toppings in one pizza. Your styles of pizza are reversed. The deep dish is Cicago style, not New York. Other than that, nice article.